Old maps showing Ridgefield, from the 1700s to the early 1900s. Profiles of hundreds of noteworthy Ridgefielders of the past, from the 1700s through modern times. Notable Ridgefielders, a who's who of 400 interesting 20th Century residents. A history of the town through its more than 1,200 place names. A timeline of more than 3,000 Ridgefield events from 1700 into 2008. Views of Ridgefield 100 years ago from old postcards. We have published a line of postcards, using century-old pictures. If you are on Facebook, join us for a look at scores of old pictures of Ridgefield, plus lots of reminiscences. Extensively annotated life of an 1860s Ridgefield farmer. An index of obituaries in The Press between 1875 and 1999, plus other information on obituaries. History, lore, data, and more about the town's two dozen cemeteries, with photos. Books, postcards, maps, etc., related to Ridgefield and area history, for sale..
Mostly histories, in and out of print. A 54-page, fully illustrated guide to village history. A site devoted to Ridgefield Historical Society and its Scott House home. In Ridgefield, he was a hero. We even issued medals in his memory! Recent past articles in The Ridgefield Press are archived online, but cost $2.95 to download. Have a question about Ridgefield history? Give us a try. 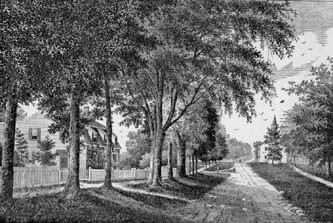 Ridgefield, Connecticut is rich in early American history. Purchased from the Ramapoo Indians in 1708, the town became the scene of the Battle of Ridgefield that starred General Benedict Arnold, then considered a hero. For more than two centuries, Ridgefield was an agrarian community. But in the late 1800s artists and writers (including six Pulitzer Prize winners and one Nobel laureate) as well as leaders of finance and industry began to discover its charms. Ridgefield also offered a new home for countless immigrants from Ireland, Germany and Italy, and finally, a home for the modern commuter. Through its 300 years, the town has had many stories to tell. Here, on RidgefieldHistory.com, are some of them, found in its people, its place names, maps, postcards, and, of course, its cemeteries. ~J.S.